An Imperial Japanese Navy specification of 1934 for a single-seat fighter with a maximum speed of 350km/h then seemed an almost unattainable target. 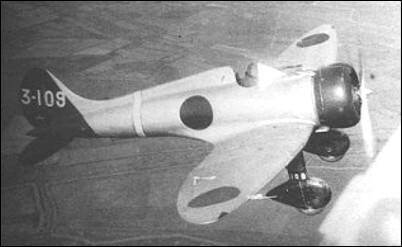 However, Mitsubishi's Ka-14 prototype designed to this requirement, and flown for the first time on 4 February 1935, demonstrated a top speed of 450km/h in early trials. Unfortunately it had some aerodynamic shortcomings, and the inverted gull-wing of.this aircraft was replaced by a conventional low-set monoplane wing in the second prototype which, with a 436kW Nakajima Kotobuki 2-KAI-1 radial engine, was ordered into production as the Navy Type 96 Carrier Fighter Model 1 (Mitsubishi A5M1). The generally similar A5N2a which followed, powered by the 455kW Kotobuki 2-KAI-3 engine, and the A5M2b with the 477kW Kotobuki 3 engine, were regarded as the Japanese navy's most important fighter aircraft during the Sino-Japanese War. Two experimental A5M3 aircraft were flown with the Hispano-Suiza 12Xcrs engine, but the final and major production version was the A5M4, built also as the A5M4-K tandem two-seat trainer. All versions of the A5M were allocated the Allied codename 'Claude', and when production ended a total of 788 had been built by Mitsubishi, including prototypes; a further 303 were built by Watanabe (39) and the Omura Naval Air Arsenal (264). The Japanese army had also shown interest in the A5M, resulting in the evaluation of a Ki-18 prototype generally similar to the Ka-14, but although fast this was considered to be lacking in manoeuvrability. Mitsubishi produced two re-engined and improved Ki-33 prototypes but they, too, were considered insufficiently manoeuvrable and no army production contract resulted. At the beginning of the Pacific war the A5M4 was in first-line use, but its performance was found inadequate to confront Allied fighters and by the summer of 1942 all had been transferred to second-line duties, many surviving A5M4 and A5M4-Ks being used in kamikaze attacks in the closing months of the war. In the invasion of China by the Japanese prior to and during WWII the A5M did not have it all it's own way. The Chinese Nationalists had purchased 36 Gloster Gladiators and on more than one occassion they proved more than a match, and it wasn't until the arrival of the A6M that the Japanese achieved full air superiority. FIRST OFF, I'M AM NOT SHOUTING, ***** THANKS TO CANCER, MY EYES ARE NOT AS GOOD. THE INFO FORGOT TO MENTION THOS WAS THE PREDICESSOR OF THE FAMED A6M REISEN AKA THE ZERO. THIS WAS STARTED BY THE IMMORTAL ADMIRAL ISOROKU YAMMAMOTO; WHO INSISTED THAT THE JAPANESE HAVE AN ADVANCED CARRIER-BASED STRIKE PLANE. I-16. Speed and overall maneuverability. Did Japan ever export aircraft before WW2?. This nifty plane would be useful to nations in need of aircraft. The A5M Claude was the predecessor of the famous A6M Zero. It was the world's first monplane shipboard fighter and was used in the Second Sino-Japanese War. Some were still in service at the start of World War II. United States intelligence sources believed the A5M was still the primary Navy fighter, but they had already been replaced by the A6M 'Zero' on first-line aircraft carriers and with the Tainan Air Group. Other Japanese carriers and air groups continued to use the A5M until production of the 'Zero' caught up with demand. The last combat actions with the A5M as a fighter took place at the Battle of the Coral Sea on 7 May 1942, when two A5Ms and four A6Ms of the Japanese carrier Sh�h� fought against the US planes that sunk their carrier. Most remaining A5Ms were used for kamikaze during the end of the war. Relax Mr.Chinese 'Nationalist'. I believe a few other nations fought against the Japanese Imperial Forces and did a bit more. This is a website for aircraft not your overly sensitive shortcomings. THE CHINESES WAGED THE BATTLES TO DESTROY THE EVIL FORCE OF THE JAPS! THE JAPANESE A5M ARE THE MAIN FIGHTER PLANES WHEN THE BEGINNING OF THE SINO-JAPANESE WAR! THE HEROIC CHINESE ACES CAN ALSO SHOT DOWN THIS ADVANCED FIGHTER PLANES! There is an A5M4-K, two seater in a military musuem, Djakarta, Indonesia. Slim, sleek and you can see its heritage with the famous A6M.. Both beautiful bits of kit!. Which one was the best? This,the P-26 or the I-16? In 2003 I identified the remains of an A5M4 in the wreck of the Fujikawa Maru which was sunk Feb. 1944, in Truk Lagoon, Micronesia. To my knowledge it is the only example of its type known to exist. Saburo Sakai, the great Japanese ace claimed the Claude type 96 was superior to the newer Zero when it came to maneuvering and dogfighting. The only advantage the newer Zero had was a much increased range.